Next year will mark the 100th anniversary of the publication of The Mysterious Affair at Styles, Agatha Christie's first novel featuring fictional detective Hercule Poirot. An acutely observant crime-solver in the tradition of Sherlock Holmes, Poirot has since been played on screen by such actors as Albert Finney, Peter Ustinov and, most famously, David Suchet, who starred in Poirot, a lengthy series presented in the U.S. by PBS. Though the series with Suchet ended in 2014, Poirot now lives again, in The ABC Murders, a three-part British production that's been imported by Amazon Prime Video. The new miniseries is based upon The A.B.C. Murders, the 13th novel in Christie's series of books featuring Poirot. The script for The ABC Murders was adapted by Sarah Phelps, whose writing and production credits in the U.K. in the last few years alone include the classy TV adaptations of Christie's And Then There Were None, The Witness for the Prosecution and Ordeal by Innocence. And the series introduces, as Christie's famously imperious Belgian detective, an American actor: John Malkovich. The ABC Murders is set, and was originally written, between the two World Wars. It's 1933 in England, where posters proclaim such anti-immigrant sentiments as, "We must stem the alien tide." Poirot, an immigrant himself, had come to England and succeeded admirably as a detective. But the man we meet now is basically retired, and long past his prime. The new police inspectors don't respect him, much less consult him. He dyes his beard to look younger, a temporary affectation that only makes him seem more outdated and desperate. But when someone begins taunting him with typewritten letters, posted daily from different cities and threatening a series of random murders of alphabetically chosen victims, Poirot is the first to take the letters seriously — letters which make it clear that the killer knows the detective well, down to his newly blackened beard. Always the smartest guy in the room, Poirot is the first to recognize when the police arrest the wrong man — pointing out the error of their ways even as Detective Bunce, played by Shane Attwooll, is taking the suspect into custody. Poirot enumerates all the reasons why the man couldn't have committed the crime — but Bunce is adamant, telling Poirot with a sneer, "Case closed." The case is far from closed, of course. It's just getting started, as victims with alliterative names — begin piling up in various cities. The clues lead, eventually, to railway stations in the country's ABC Railway Guide — but also connect to the detective's past. Phelps adapts this particular mystery novel taking a few liberties, and all of them are commendable. The hero is more vulnerable, even tragic, and Malkovich plays him tenderly, without overplaying him at all. The supporting characters are more colorful — in fact, more Dickensian — and some of them act a lot saucier, and kinkier, than any character from a Christie novel. And the mystery itself, almost a century later, still works — and still entertains. This is FRESH AIR. I'm TV critic David Bianculli. 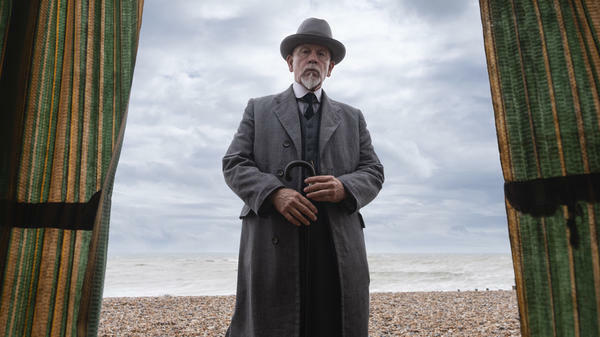 Amazon Prime Video imports a new TV miniseries today - a three-part mystery drama called "The ABC Murders." It's the latest adaptation of a novel by Agatha Christie, starring one of her most famous fictional detectives, Hercule Poirot. And this time, Hercule is portrayed by John Malkovich. Next year will be the 100th anniversary of the publication of the first Agatha Christie novel featuring Hercule. He's an acutely observant crime solver in the Sherlock Holmes tradition. He has a thick Belgian accent. And he's been played on screen by such actors as Albert Finney, Peter Ustinov and, most famously, David Suchet, who ended up starring in all the stories in a lengthy series presented here by PBS. That series ended five years ago. But now, in a new British production imported by Amazon Prime Video, Hercule Poirot lives again. This time, the novel is "The ABC Murders," the 13th in this particular Christie series. It's adapted by Sarah Phelps, whose writing and production credits in the UK in the last few years alone include the classy TV adaptations of Christie's "And Then There Were None," "The Witness For The Prosecution" and "Ordeal By Innocence." And "The ABC Murders" introduces as Christie's famously imperious Belgian detective an American actor - John Malkovich. "The ABC Murders" is set and was originally written between the two world wars. It's 1933 in England, where posters proclaim such anti-immigrant sentiments as, we must stem the alien tide. Poirot, an immigrant himself, had come to England and succeeded admirably as a detective. But the man we meet now is basically retired and long past his prime. The new police inspectors don't respect him, much less consult him. He dyes his beard to look younger, a temporary affectation that only makes him seem more outdated and desperate. But when someone begins taunting him with typewritten letters posted daily from different cities and threatening a series of random murders of alphabetically chosen victims, Poirot is the first to take the letters seriously - letters which make it clear that the killer knows the detective well, down to his newly blackened beard. Poirot, always the smartest guy in the room, is the first to recognize when the police arrest the wrong man, pointing out the error of their ways even as Detective Bunce, played by Shane Attwooll, is taking the suspect into custody. JOHN MALKOVICH: (As Hercule Poirot) It isn't him. Use your eyes, Detective Bunce. SHANE ATTWOOLL: (As Detective Bunce) Alice Asher's neighbor said he was always threatening his wife, that he said he was going to cut her throat, that he was going to cut her head clean off. And he practically did cut her head clean off. UNIDENTIFIED SPEAKER: (As character) Her head? Her head was cut off? ATTWOOLL: (As Detective Bunce) Like you don't know. MALKOVICH: (As Hercule Poirot) To inflict such a mortal wound with a weapon inadequate to the task requires great strength. Monsieur Asher is a dipsomaniac. He has delirium tremens. He could not strike a match, let alone wield a knife. And where is the blood? He's not washed his hands. There would be blood ingrained in the beds of his fingernails, the skin of his knuckles, his wrists, the cuffs of his shirt. There would be blood everywhere. It isn't him. ATTWOOLL: (As Detective Bunce) He bought some gloves, and then he chucked them after. MALKOVICH: (As Hercule Poirot) Mon dieu, Detective Bunce. You are no student of human frailty. Any money he has, he spends on his demon, on alcohol. He would not buy gloves. And the cash register was undisturbed. If money were the motive, he would've taken it. ATTWOOLL: (As Detective Bunce) You reckon you know it all, don't you? Well, you don't. Case closed. BIANCULLI: The case is far from closed, of course. It's just getting started as victims with alliterative names - Alice Asher, Betty Barnard - begin piling up in various cities. The clues lead, eventually, to railway stations in the country's ABC railway guide, but also connect to the detective's past. Sarah Phelps adapts this particular mystery novel, taking a few liberties, and all of them are commendable. The hero is more vulnerable, even tragic, and Malkovich plays him tenderly without overplaying him at all. The supporting characters are more colorful - in fact, more Dickensian - and some of them act a lot saucier and kinkier than any character from an Agatha Christie novel. And the mystery itself - almost a century later, it still works and still entertains. On the next FRESH AIR - before states ran legal lotteries, there was the underground street version - the numbers. Bridgett Davis talks with Terry about growing up with an enterprising mother who was a numbers runner in Detroit in the 1960s and '70s. She did well and raised her five children in a comfortable home that she owned. Davis has written a memoir about her experience. Hope you can join us. FRESH AIR's executive producer is Danny Miller. Our technical director and engineer is Audrey Bentham, with additional engineering support from Joyce Lieberman and Julian Herzfeld. Our associate producer for digital media is Molly Seavy-Nesper. Thea Chaloner directed today's show. For Terry Gross, I'm David Bianculli. (SOUNDBITE OF ELI DEGIBRI'S "REMEMBER") Transcript provided by NPR, Copyright NPR.